Dommers puts her heart out and gets involved with her clients on a personal level. I hope I reflect the commitment I have to my clients, when they trust me to find or sell them a home, said Dommers. When Kristina Dommers visited the Real Living Lifestyles Del Mar office she felt comfortable from the minute she arrived. “The manager, Dixie Courtney, spent a lot of time making sure I understood everything we talked about and it just felt right,” commented Dommers. After years in the service and hospitality industry and raising four children, she decided that it was her time to shine. She jumped into the real estate business without looking back. Dommers takes a personal interest in each client’s story. It helps her to make a connection and see through their eyes. When it comes to real estate, she thinks outside of the box to get the best results for her clients. Having such a big family has taught her how to juggle many things and wear many hats. While in the service and hospitality industry she learned how to keep her customers happy and brought that attitude along into real estate.. “I hope I reflect the commitment I have to my clients, when they trust me to find or sell them a home,” said Dommers. Dommers grew up in Spokane/Seattle Washington and attended college in Lincoln, N.E. Currently she lives in Del Mar with her husband of almost 20 years and her youngest child. She and her family choose San Diego because of the weather, the beach, and the schools. 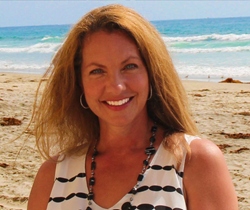 When not dedicating her time to real estate Dommers enjoys singing in her band “Ridge”, surfing, hanging out with her four children, and attending football games – Go Torrey Pines! To reach Kristina Dommers email her at beachhome4sale@gmail.com or by phone #619-567-7898.